Here you remember your table number and order food up at the bar, and it wasn’t long at all before our food started to arrive. First up, we went with the ‘grazer sharer’, a dish which I’ve often wondered why places don’t offer. 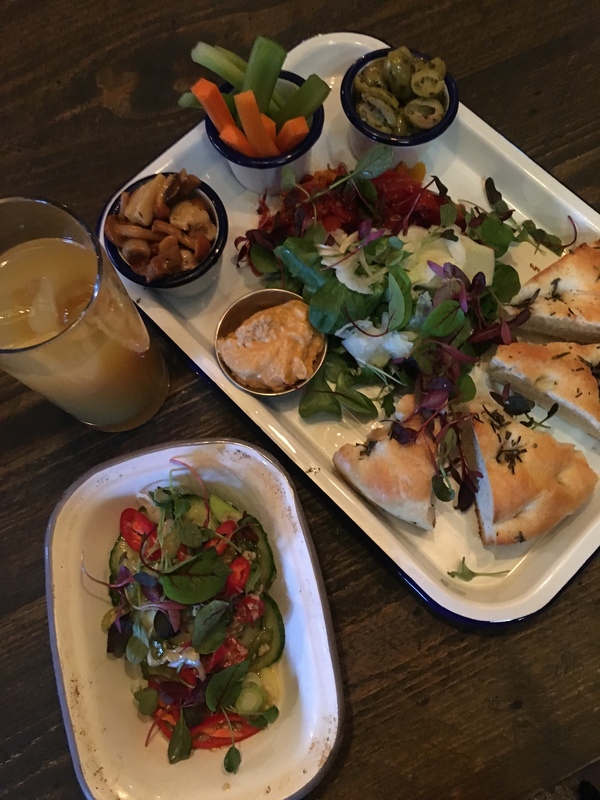 There’s nearly always a mezze style sharing starter for vegetarians at a pub, but it undoubtedly comes with mozzarella or dairy-based dips, so it was refreshing to see a veganised version. It comes with big wedges of rosemary focaccia which is soft and delicious dipped into the bowl of smoky houmous. There’s a wonderful pile of cooked peppers and sundried tomatoes which are packed with flavour. A little pot of mushrooms which I think is a genius idea, again extremely flavourful, almost like the taste of a creamy mushroom soup. The only downside was that the way they’re served cold and straight out of the fridge made them a bit slimy, the same with the roasted veggies. There’s a pile of crisp, fresh salad with a vinegary sauce, giving a hint of aniseed from nicely pickled fennel. This whole plate just had a great balance of sweetness, umami, salty and smoky flavours and I loved it. The only thing I didn’t touch was the olives, because I’m a bad vegan and I hate them, but Jamie said they were great and they were very generous with the amount in the bowl. We’d ordered a couple of sides, the first of which was a definite hit. 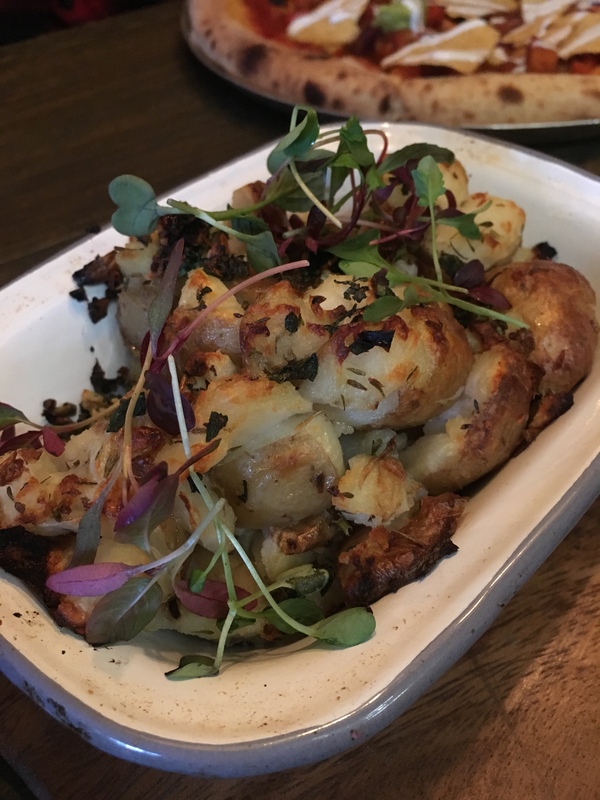 The garlic and herb crushed potatoes were beautiful, a little crispy from the way they’d been cooked, with a salty earthiness from the skins left on. Seasoned to perfection, I’m not exactly sure what I would order these with to make a meal, but I wouldn’t want to miss out! 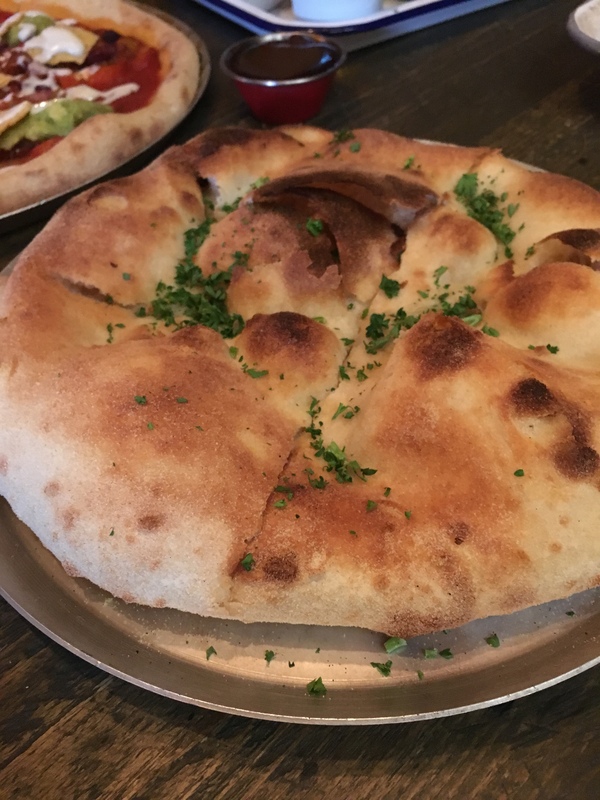 The flatbread was… flatbread. It was nicely baked bread but a bit dry, and without any garlic or compared to the punchiness of some of the other flavours, it didn’t really do it for me. Lastly we tried the miso cucumber and sesame side salad. It does what it says on the tin, but you can expect a real kick from plenty of chilli – not actually marked on the menu so you’ve been warned! It had plenty of garlic in, was aromatic and pleasantly salty from the miso. Nice and fresh and something quite different from your average British pub sides section of the menu. At only £2.50 I think it was worth trying. First up on the main courses was the five-bean chilli. You may have seen from my instagram stories that I’m not a big fan of pubs whose best effort at providing an option for vegans is a lowly vegetable chilli. At least this one seems like a bit of effort has gone into it (and in any case, it’s by far not the only vegan thing on the menu). 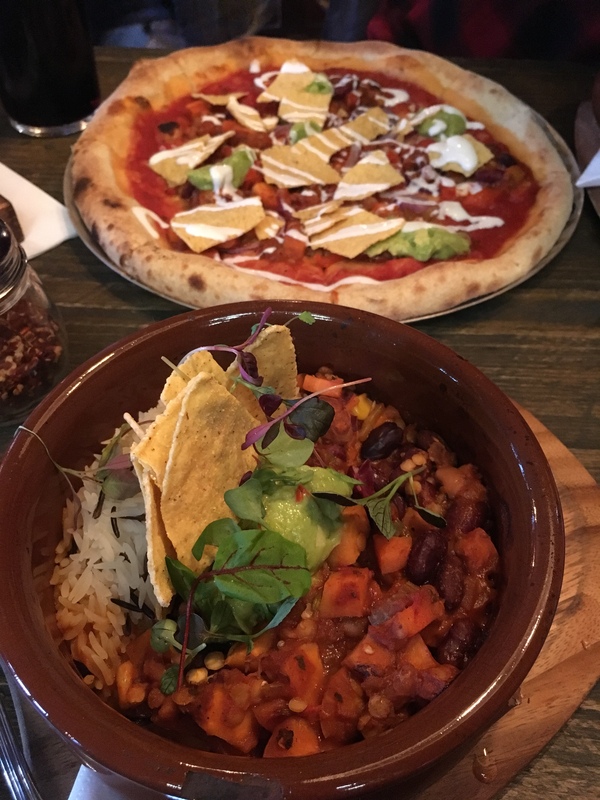 The chilli was served on a pile of mixed wild rice which was nicely cooked and helped the bowl retain some texture along with the crunchy tortilla chips. The lentil and veggie mixture itself was pretty mild in comparison to the starters, and quite sweet, especially with the sweet potato. Some bits of the root veg were undercooked. There was the right ratio of sauce to rice though which kept the dish from being dry, and the guac was fab, with a generous squeeze of lime and plenty of salt. As I said, I’m not going to leap to order a chilli while I’m out because I cook it on the regular at home, but as they go, this was a nice one (and this was Jamie’s first choice, so each to their own)! My absolute favourite thing that we tried during the evening was the Tahini Cauliflower. The ‘Pizza, Pots, Pints’ concept It comes looking a bit like a brightly coloured bowl of porridge with some salad on top. Nutty spiced cauliflower sits on a bed of a pea and butterbean ‘crush’, definitely the nicest way I’ve ever seen these beans used in a dish. It was slightly sweet from the peas but well-salted, and the texture wasn’t grainy like I’d half expected from the bean skins. On top you got a bit of extra crunch from some root vegetable crisp, more fennel, and a load more of that delicious houmous which I loved in our starter. I actually like how the menu makes use of a lot of the same ingredients across different dishes, as I assume it helps with waste, and it’s interesting to see how they use it in different ways. 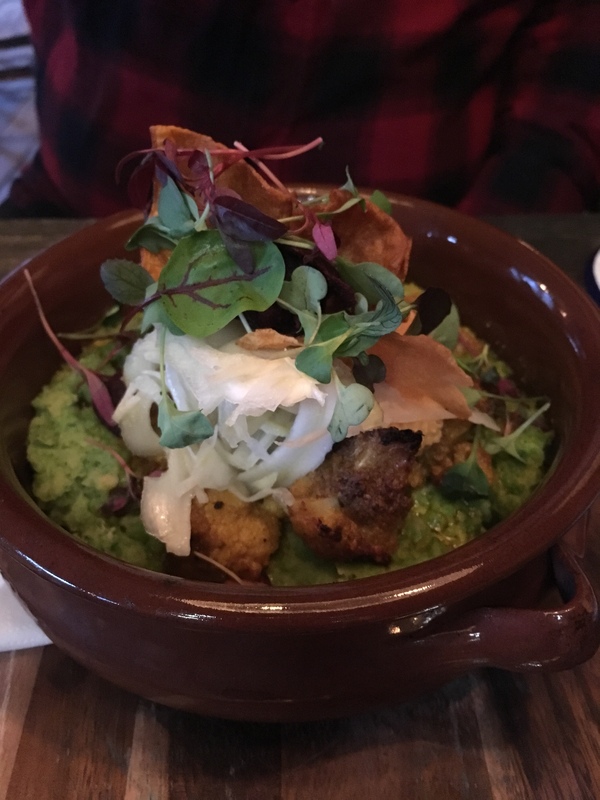 This was such a delicious, warm and comforting bowl, and I really appreciated seeing something so different on a pub menu. Would absolutely go there again for this. This was a complimentary meal thanks to The Oxford Blue, all thoughts on the food are my honest opinions.